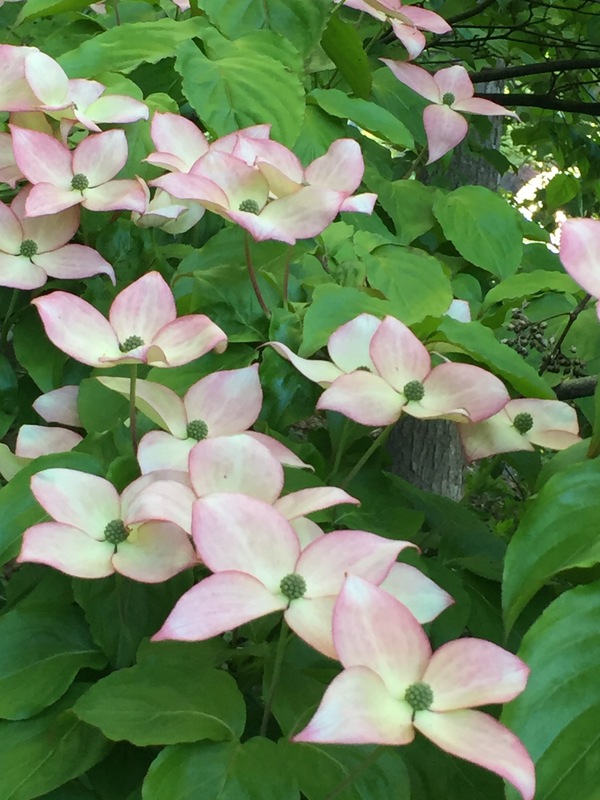 My friend’s dogwood is in full bloom. I love the hint of pink in the petals. By the time I took the photo the sky had clouded over. 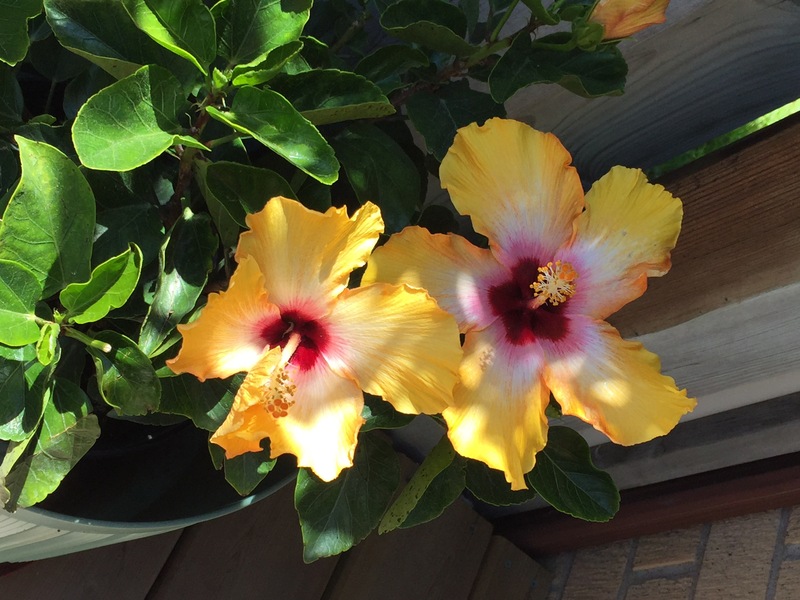 Just imagine the glow with a bit of sunlight hitting the blooms. 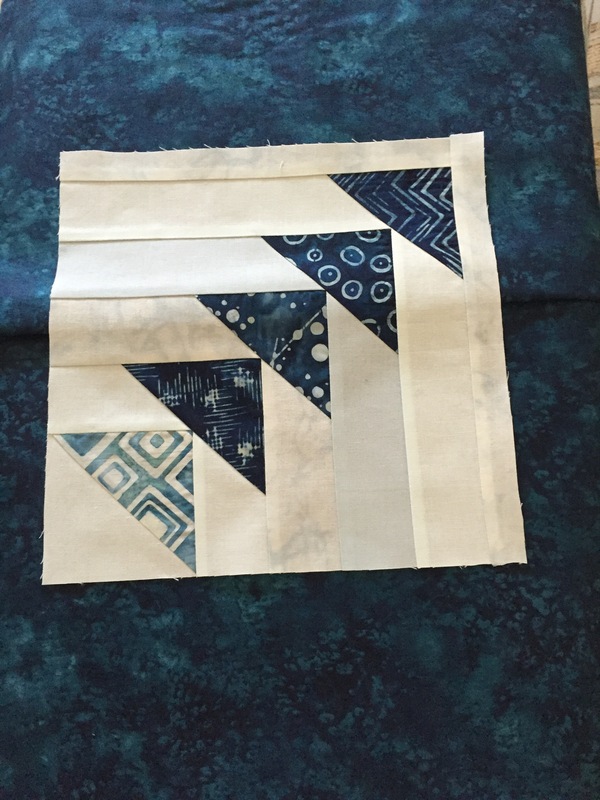 I made just eight blocks for the back (needed only seven) but I want to do a whole quilt top using fabric from my scrap box. I think I can arrange the triangles in some interesting random array. You can see I did add a bit of golden yellow in the insert – I thought the teal hues alone were a bit drab given that the top used a limited colour palette. I’ve now pinned the top, batting and back together and am ready to quilt the sandwich. I’ve set up an embroidery design for the 360 x 200 hoop – by my calculation it should take 35 (5 x 7 array) repeats to edge-edge quilt the whole thing. I was supposed to teach a class on how to take a piece of fabric (a ~7″ square, for example), slash it, insert a narrow strip, slash a second time, crossing the first insertion, and insert a second narrow strip. The first insertion is easy, the second takes a bit of adjusting. 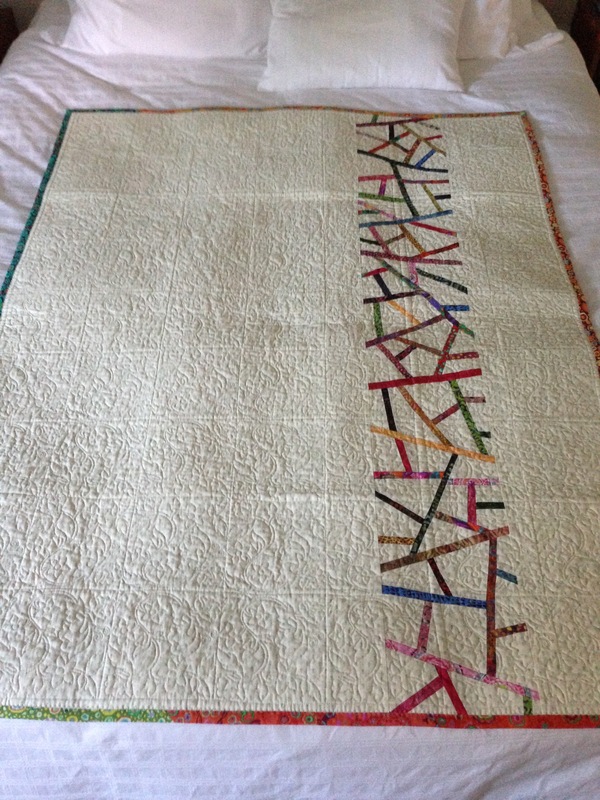 I called the quilt “pick-up-sticks”. 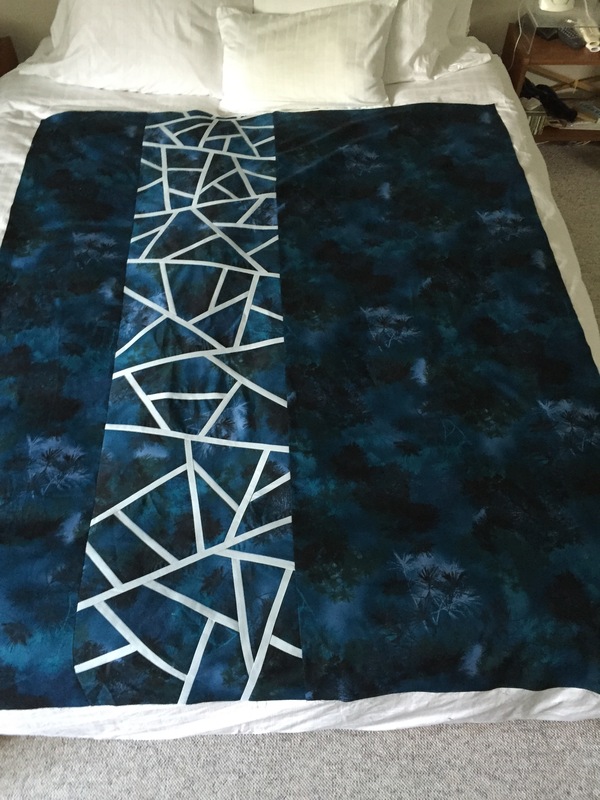 Rather than make another Pick-Up-Sticks quilt for myself, I decided to use the technique to create a wide panel the length of a quilt top and insert it into a length of background fabric for the top. 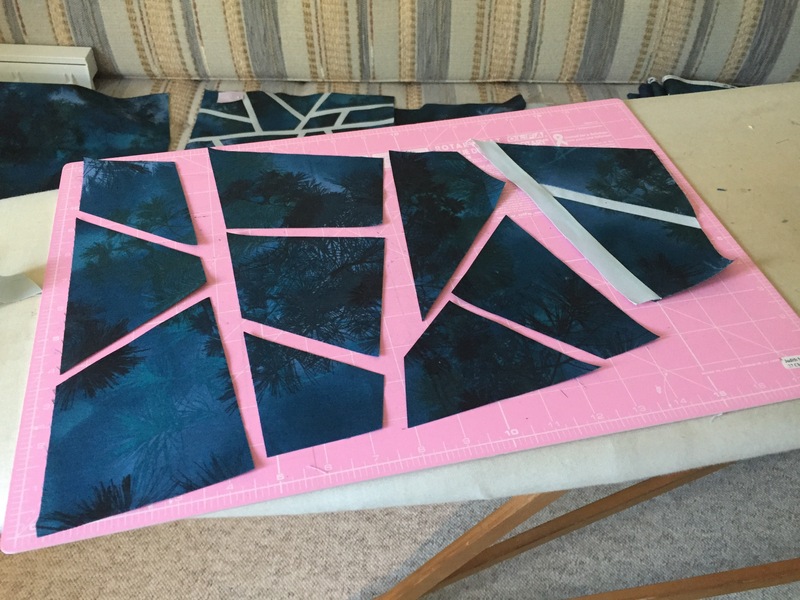 Not difficult to do – I cut two 16″ WOF pieces, cut off a segment at a time, slashed the fabric (rotary cutter and ruler), laid out the pieces, then added insertions. The trick with this technique is to keep the pieces laid out in order so you can tell which bit gets joined to what! Also I was careful to mark the “top” edge of the uncut fabric, as well as the top edge of the growing strip – that’s because I was cutting my large sections of fabric as irregular quadrilaterals, not as rectangles, so I needed to be able to align the bottom of a finished segment with the top edge of the subsequent one. I created the full panel with seven segments. The piecing went quite quickly. I used 1/2″ inserts (1″ strips) which made up for the seam allowances and maintained the original dimensions of each uncut segment. Now for the second side (I hesitate to call it a back because there will be quite a bit of piecing involved). Flying geese blocks – they require precision in the cutting, in the stitching, and in the trimming. 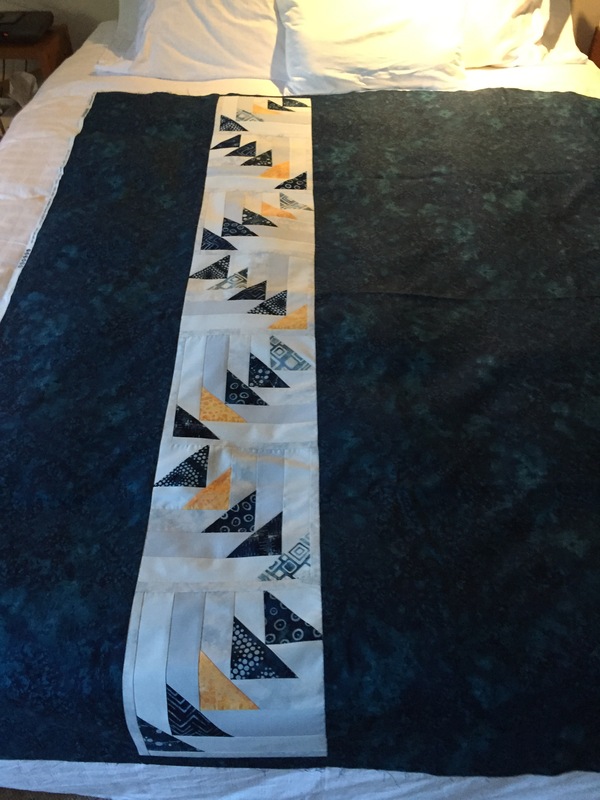 I finished one block when I realized I needed a narrow strip on two sides to provide contrast for the final triangle to show up against the background fabric! Now I’m thinking I want a wee bit of a golden yellow in there as well – maybe as strips to join these blocks into a panel to be inserted into the background fabric…. Another improvisation using variegated yarn. I broke the pattern using the teal colour insert. Because I had only one 50g ball of variegated yarn for two socks, I had to locate the mid-point of the ball – I realized that half-way through the first foot! So I stopped where I was, unravelled the ball of yarn until I located the matching starting point for the second sock, cut the yarn, then began working on the second sock. My plan was to knit until I ran out of yarn on the second sock and then unravel the first sock back to the same location in the pattern. I was lucky, I’d stopped just about at the center and so I didn’t have to unravel anything on the first sock when I resumed knitting after finishing the second sock! I’m happy with how they turned out. So into the stash this pair goes. I started a new pair last evening – this for Edouard whose feet are cold these days. Black/white variegated yarn with an orange-red accent yarn. I thought this red/orange pair were likely too bright for him to feel comfortable wearing them so I made this pair my standard women’s size. 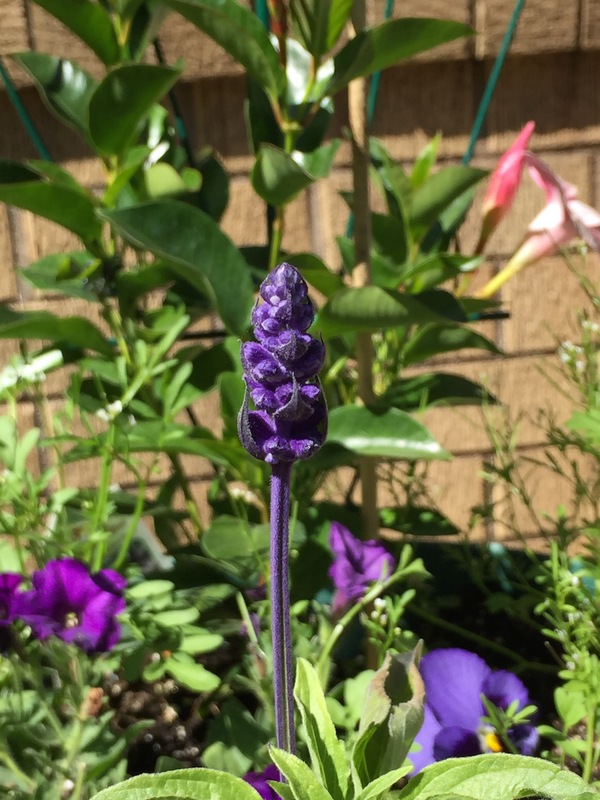 It turns out what I planted the other day isn’t Lavender but Victoria Blue Salvia. Some friends came up with suggestions such as Indigo but the leaves were all wrong for Indigo. I finally searched for “purple flower spikes” and found the plant. That explains the lack of scent. There are auxiliary shoots in the leaf axils which will also produce flowers ending up with lots of purple spikes as the season advances. The plants are looking happy in their new container homes. So the plant was a good choice. Just finished! Label and all. 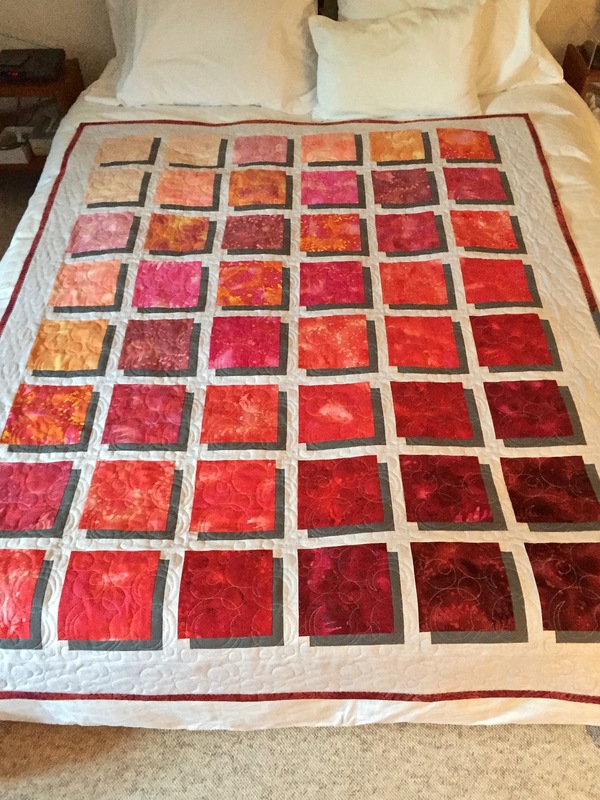 Took the better part of three days to quilt all the blocks. What I like about this embroidery is that it fills the block completely. In fact, after I pin basted the layers, I didn’t stitch in the ditch to tie the top / batting / backing together. I left the pins in and simply embroidered each block – 48 blocks, plus the borders (24 repeats) and corners (4). I used a 200 x 200 quilting hoop for the blocks, the grand endless hoop for the borders – I love using the endless hoop because I don’t have to remove the hoop from the machine, just move the quilt edge along after each embroidery (once I figure out where I want to position it for the placement I’m after). The borders go very quickly. 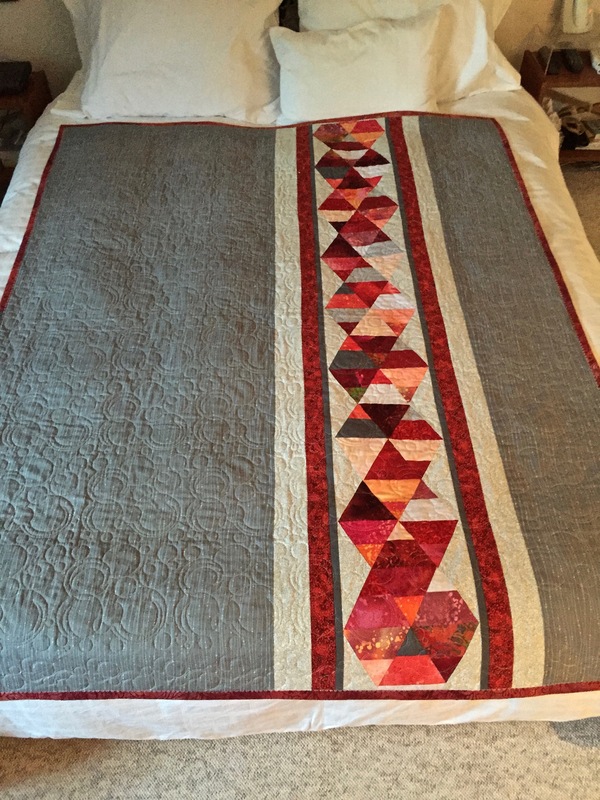 The backing started out with 2 1/2″ strips – sewn together in pairs – had I thought about it a bit more I’d have been better off using 4 1/2″ WOF cuts and cut the triangles from those – the diamonds would have stood out better. Not that there’s anything wrong with what I’ve done. I will have to try another quilt using half diamonds from a single fabric to see what that will turn out like. My plan is to cut two 16″ WOF strips from the dark print and 1″ strips from the soft, pale blue/grey (which will give me 1/2″ inserts). 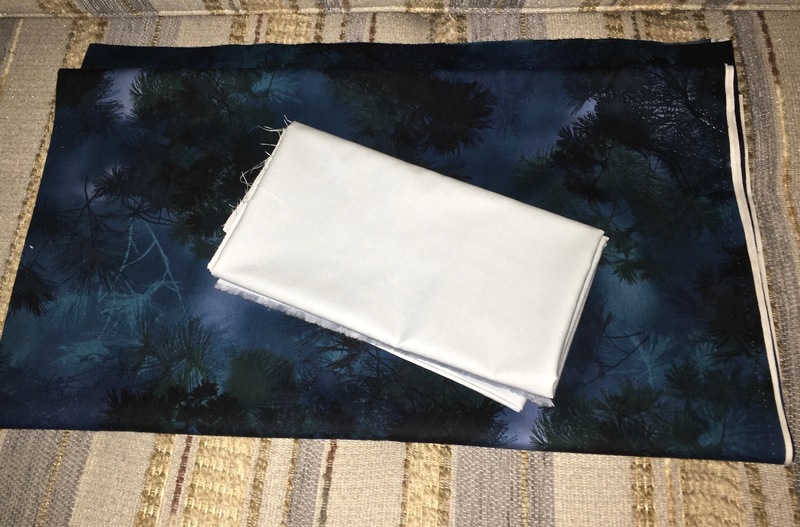 I will do an improvisational strip like one I used on the back of an earlier quilt – but this time the strip will be much wider and will be the top of the quilt. I have been thinking about the back of the new quilt as well – I bought a couple of sets of fat quarters in shades of teal (dark and light) when I visited Keepsake Quilting two years ago – one of the sets includes just 6 pieces of fabric – that will be enough to do something within an overall backing fabric – no idea yet what colour the backing should be – somewhere in the teal family, I’m guessing, to go with the top. Tomorrow I will cut the fabrics for the top and begin piecing and see what I end up with. I love starting new projects – I never quite know what I’m going to get. I haven’t put a lot of effort into my container garden this year because I’m moving out July 12 and leaving it for the new owners. 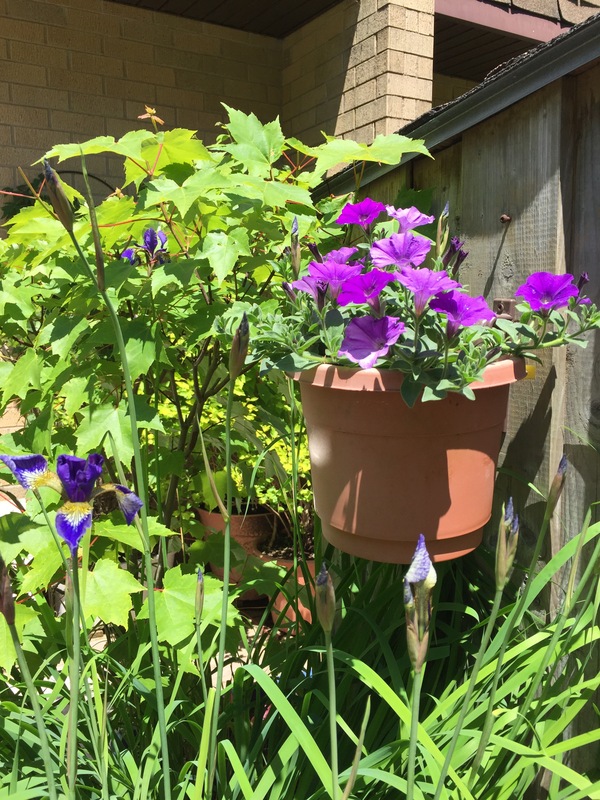 So in the spring to fill the pots I dug up sprouting plants from nearby garden beds and stuck them in the containers which would normally hold showy annuals. Two pots held forget-me-nots which bloomed early, then they were attacked by mildew, so yesterday I pulled them out but wanted to replace them with something. I found some inexpensive New Guinea impatiens, four seedlings in a basket, and another which has purple flower on a stalk – looks like it might be lavender but I’m not detecting any lavender scent yet, maybe the flowers aren’t far enough along. In any case they fit the bill and look good in the pots. The Siberian iris has started blooming – in another day or two there will be several fully open. The single small petunia seedlings I stuck in the hanging pots has filled out and looks great. Their purple colour complements the iris. 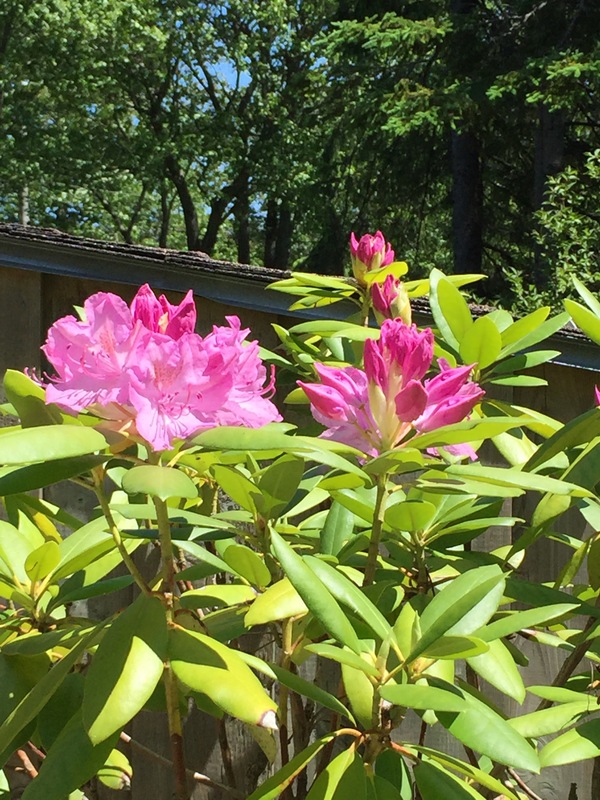 The rhododendron flowers are also now opening. 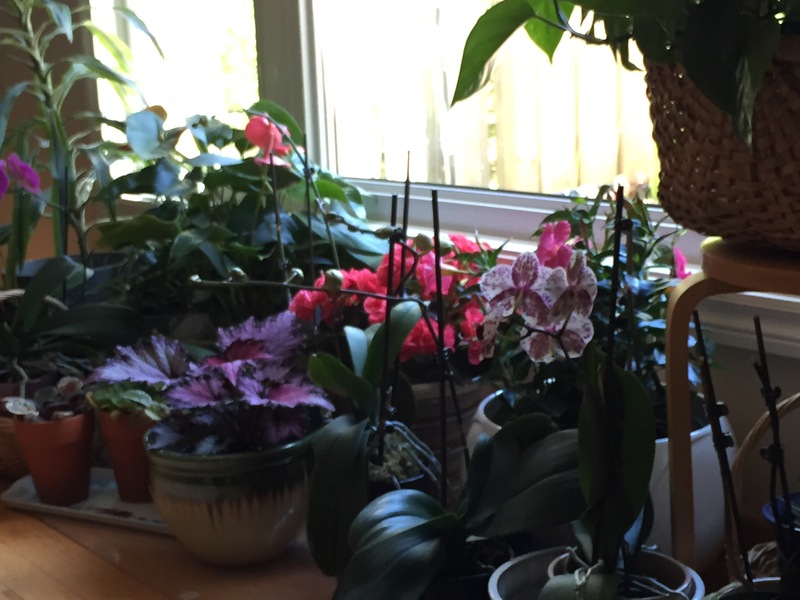 A house without plants just isn’t a home, as far as I’m concerned!